Just a short drive from Phoenix, in the high Sonoran Desert, Rancho Manana is one of the most picturesque golf courses in Arizona State and offers a truly remarkable series of holes from which golfers can marvel at the magnificent views of the surrounding landscape. The front nine at the stunning Rancho Manana takes the golfer higher and higher into the Sonoran Desert and with each elevation change comes a more spectacular view than the last. With five of the surrounding mountains and the impressive Tonto National Forest in view simultaneously it may just become difficult to concentrate on your golf! 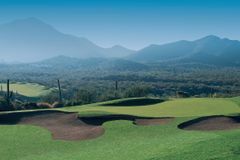 In stark contrast to the front nine the back nine is guarded by a series of tranquil water features and with an array of tee positions on offer Rancho Manana will provide an enjoyable test of golf to golfers of all abilities. Rancho Manana’s desert location also makes the course a great place to spot some local wildlife including the likes of bobcats, roadrunners and mule deer.